Well, it is Black Friday and I have already been out and about. Since most of my shopping was completed last week, I really didn’t “have” to grab any bargains today and after witnessing the Walmart parking lot at 5:45 am, I have decided that I am officially too old to attempt the crowds. I did manage to find an 8 inch digital photo frame for $29 that I will put away for my mom’s birthday in April, and I treated myself to new measuring cups, measuring spoons, and pastry cloth with a 20% off coupon at Bed, Bath and Beyond. I managed to be one of the first 100 customers in line at Half Priced Books so I received the free book bag and a $5.00 coupon. After meandering through the store for over 45 minutes, I finally settled on the purchase of two books from the Elements of Fiction Writing Series: Characters and Viewpoint by Orson Scott Card and Plot by Ansen Dibell. While I doubt I will ever write a novel myself, I am intrigued by the process and I figure that learning about these topics will help me better appreciate the books that I read and teach. After I finish skimming these books, I may either try to finish Crossing Washington Square by Joanne Rennell (I started this book about a week ago and while it is mildly entertaining, I find it difficult to stay interested for long periods of time) or I may try to begin The Children’s Book by A. S. Byatt, although I would have to read it rather quickly as it is due at the library on Tuesday. At any rate, I will plan to spend some time reading and catching up on the blog entries I have missed these past couple of weeks. I have read where many of you have already started to sign up for 2010 reading challenges and I must admit that I am tempted to check some of those out. There is a part of me that hesitates to join any challenges next year, as I have not done well in 2009. But I think this requires some contemplative thought before I make any hasty decisions. For those who are relaxing with this easy going reading challenge, I look forward to reading your posts. For those who are braving the shopping crowds, I wish you much bargain hunting success and safe travels. I signed up for a ton of 2010 reading challenges. I usually do horrible with challenges but so many of them sound so good I'm not going to resist. I also plan on not putting any pressure on myself to complete them either. I heard that though The Children's Book is a great read, it's also a slow one. You may want to renew it. You are one brave woman, hitting the sales on Black Friday. 🙂 My husband made sure the animals let me sleep in this morning–I didn't get up until just before 8. That doesn't happen often! I decided not to sign up for any challenges this coming year. It's been hard to resist as many are so tempting. I've been good so far though. Sounds like you have a full weekend planned, decorating the house and reading. I hope you have a wonderful weekend, Molly. I'm happy with the challenges I signed up for this year….Most were ongoing. I'll probably do the same for 2010. Good job on surviving Back Friday. Have a fun stress-less weekend of reading. There were years when my parents were down here in Florida for Thanksgiving that my mom and I would no only participate in the early stuff on Black Friday, but would even shop on Thanksgiving afternoon while the men were scratching themselves and watching football! But none of that for me this year. I'm doing quite a bit of shopping online this year, as we are having Xmas in Indiana and everything has to be shipped! I hear ya about the crowds, ugh. My husband was nice enough to brave them to get us a cheap printer. Hooray! =) I've been meaning to get around to Beowulf on the Beach–I've heard it great. I am too old to fight the crowds too! We're watching football with our son and nephew. I'm avoiding the stores today, too. Daughter #1 had 5 friends spend the night and they all left the house by 4AM!! She was back home and in bed by 8. 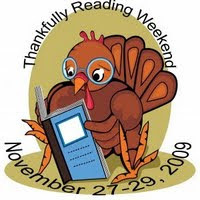 I'm reading blogs and finished a book (North River by Pete Hamill), but now have to get ready for the 'leftover feast'. There are some great-looking challenges out there for 2010, but I haven't joined any… and am seriously thinking of skipping challenges altogether next year. I decided to do a bunch of challenges in 2010 but I made sure to pick ones that "allowed" rereads and crossovers from other challenges. I figure I'll see how it goes next year and then decide whether to do more/less/the same number for 2011. I hope you've had a chance to rest since this morning and are enjoying Thankfully Reading weekend! Enjoy! Hope your day really did turn out to be relaxing. I have done absolutely nothing today but fiddle around on the computer and read a bit. I really want to blog hop a bit and get caught up on everyone–my blog time has been pretty nonexistent the past couple of weeks and I miss it. I considered the Walmart ad, and then decided no matter how badly we need a new cheap vacuum, there was no way I was getting into those crowds. We'll just have to make do with a lint roller . . . I hope you get in plenty of reading time this weekend! Because my site is so new I've opted for signing up for a bunch of challenges this coming year and it may end up catching up with me. But I also saw so many I thought I could handle and would love to try! Good luck on your reading weekend, we're attempting the same thing and having a great time! I normally avoid Black Friday shopping like the plague, but getting in on bargains at the bookstore just might have drawn me out. Good job getting there in time to get the freebies. Have a great weekend.